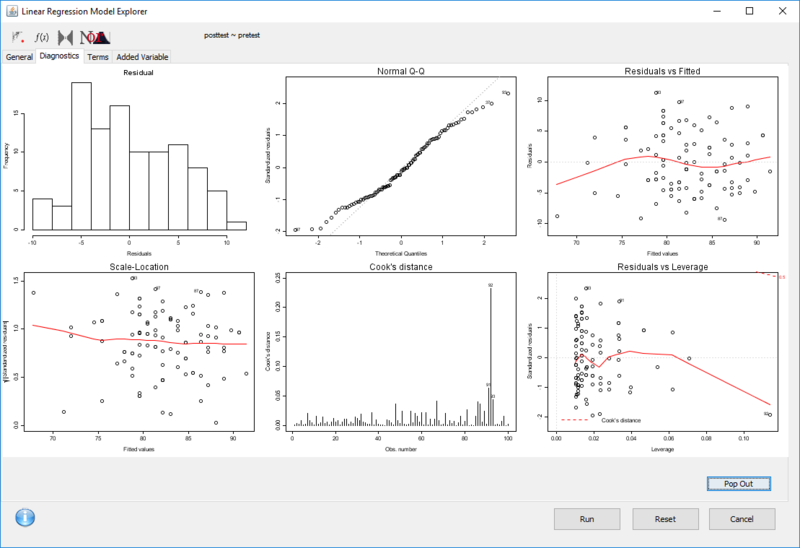 Deducer is a free and open source Graphical User Interface for the R software, one that provides beginners a way to point-and-click their way through analyses. It also integrates into an environment designed to help programmers be more productive. Deducer is available on Windows, Mac, and Linux; there is no server version. This post one of a series of reviews which aim to help non-programmers choose the Graphical User Interface (GUI) that is best for them. However, the reviews will include a cursory description of the programming support that each GUI offers. Figure 1. JGR console with Deducer menus (left) and Deducer data viewer (right). GUI = Graphical User Interface specifically using menus and dialog boxes to avoid having to type programming code. I do not include any assistance for programming in this definition. So GUI users are people who prefer using a GUI to perform their analyses. They don’t have the time or inclination to become good programmers. The various user interfaces available for R differ quite a lot in how they’re installed. Some, such as jamovi, BlueSky, or RKWard, install in a single step. Others, such as the R Commander and Rattle, install in multiple steps. Advanced computer users often don’t appreciate how lost beginners can become while attempting even a simple installation. The HelpDesks at most are flooded with such calls at the beginning of each semester! If you haven’t already done so, install the Java JRE. If you’re on Windows, I recommend the Windows x64 64-bit version. Download and install R. You should only need to keep the 64-bit version there too. Within the JGR Console, start Deducer by choosing “Packages & Data> Package Manager" and clicking the checkboxes labeled “loaded" and “default" in front of both “Deducer" and “Deducer Extras", then close the box. If you wish to get publication-quality output, download and install DeducerRichOutput from here. Finally, if you wish to start Deducer by clicking an icon (instead of typing two R commands) download the JGR launcher from here. If you have problems with this working start over while paying particular attention to where the instructions say, “as administrator." If your goal is to point-and-click your way through analyses, you probably won’t care for that much complexity. However, if your goal is to learn how to program in R, following those steps will help you on your way. Some of those steps are tasks you must learn when programming R.
When choosing a GUI, one of the most fundamental questions is: what can it do for you? What the initial software installation of each GUI gets you is covered in the Graphics, Analysis, and Modeling sections of this series of articles. Regardless of what comes built-in, it’s good to know how active the development community is. They contribute “plug-ins" which add new menus and dialog boxes to the GUI. This level of activity ranges from very low (e.g. RKWard) through moderate (e.g. jamovi) to very active (e.g. R Commander). DeducerHansel: (Experimental) An add-on package which covers many methods common in econometrics, including binary logit, binary probit, and tobit estimates, and various time-series, panel, and spatial data methods. The time-series methods include cointegration analysis. Some user interfaces for R, such as jamovi, start by double-clicking on a single icon, which is great for people who prefer to not write code. Others, such as R commander and Rattle, have you start R, then load a package from your library, then call a function. That’s better for people looking to learn R, as those are among the first tasks they’ll have to learn anyway. Load the JGR package from your library by executing the command: “library(“JGR")". Start JGR by executing the command: “JGR()" and, if you followed the installation instructions above, JGR will start Deducer automatically. Both of the screens shown in Figure 1 will appear. However, if you make it successfully through all seven installation steps described above, you can also start Deducer by double-clicking on the JGR Launcher icon. 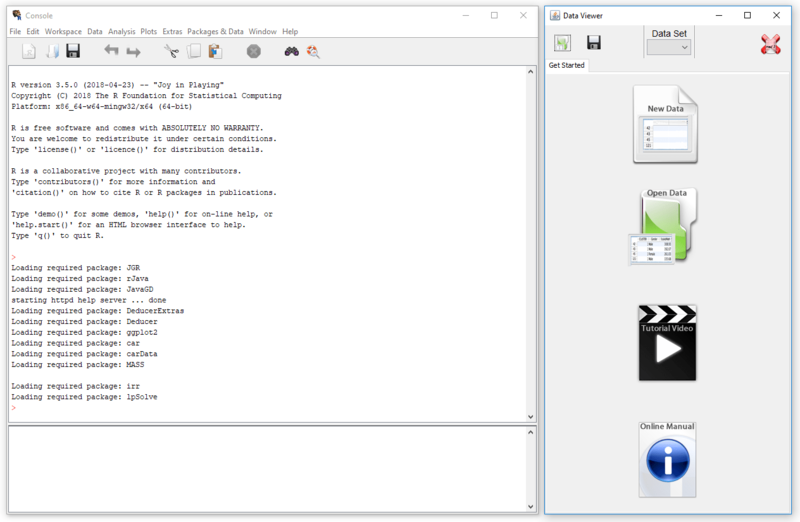 Deducer’s data editor is named Data Viewer. That can be confusing since many well-known software packages – including RStudio, the R Commander, and SAS Studio – use the term “viewer" for tools that let you see but not edit the data. The first time I used Deducer, I spent an embarrassing amount of time trying to find the “data editor" when it was right under my nose! Figure 2. Deducer’s Data Viewer with the “Data View" tab selected (upper left). I have right-clicked on the variable name of “q2" and it displayed a menu of tasks to perform. You can start Deducer’s Data Viewer by choosing “File> New Data". You then provide a name, and click OK. You’ll see it execute a command like, “mydata <- data.frame()" but the Data Viewer may not show you an empty spreadsheet. It tends to lock onto your last data set, but you can choose the drop-down menu labeled “Data Set" to get to the name of the one you just started to create. An empty version of the screen shown in Figure 2 will appear. You can start entering data immediately, though the variables will be named V1, V2,… at first. Numeric and character data will be fine, but don’t enter any other type of variables yet, such as dates. 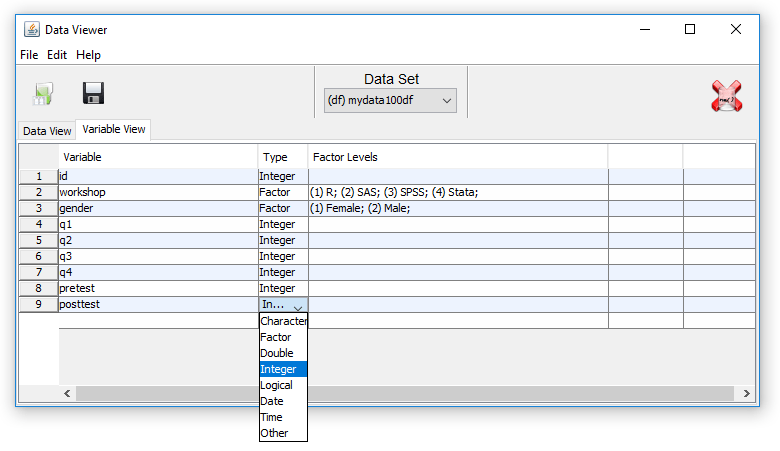 Before you go very far, it’s important to click on the “Variable View" tab and fill in your metadata, such as variable names, Type and Factor Level (see Figure 3). When the metadata are filled in, the data editor may wipe out any existing data! For example, if you enter some dates like “8/31/2018" it will be stored as character. If you then switch to the Variable View, and click on Type for that variable, and choose “Date" from the drop-down menu, the editor will delete the exiting dates. 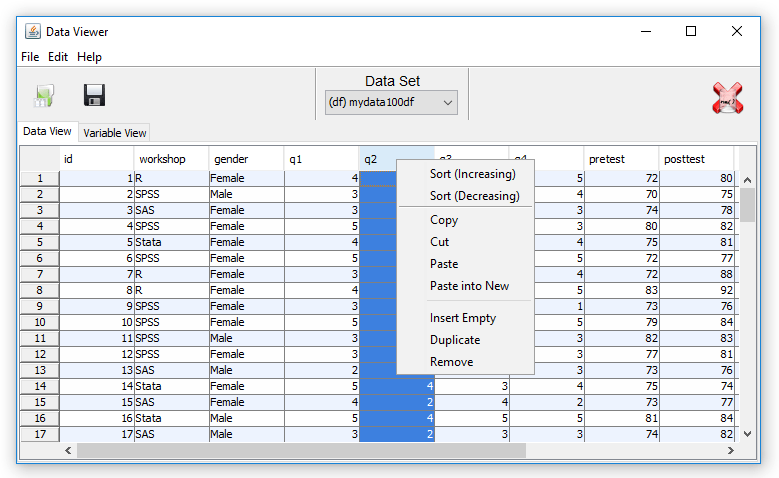 This combination of Data View/Variable View is a common one which was made popular by SPSS. In that software it offers great power by letting you copy metadata from one variable to dozens of others. So you might have survey data where, 1="Strongly Disagree", 2="Disagree",…"5="Strongly Agree". SPSS would allow you to define this for one variable, the copy it and paste it into many others. Deducer’s Variable View does not allow that. You must work one variable at a time, which gets quite tedious. To open an existing data set, choose “File> Open Data". If it doesn’t appear in the Data Viewer window, choose it from the Data Set drop-down menu. Figure 3. Deducer’s Data Viewer with the “Variable View" tab selected (upper left). This displays and lets us edit the metadata for the same data as shown in Figure 2. Saving the data is done with the standard “File> Save As" menu. You must save each one to its own file. While R allows multiple data sets (and other objects such as models) to be saved to a single file, Deducer does not. Its developers chose to simplify what their users have to learn by limiting each file to a single data set. However, you can also save or load multiple data sets by using JGR’s workspace save and open menu items. This strikes a good balance as beginners will relate to the simplicity of one-data-set-per-file, while advanced users will like the option to deal with more complex multi-object workspaces. It’s often said that 80% of data analysis time is spent preparing the data. Variables need to be transformed, recoded, or created; missing values need to be handled; datasets need to be stacked or merged, aggregated, transposed, or reshaped (e.g. from wide to long and back). A critically important aspect of data management is the ability to transform many variables at once. For example, social scientists need to recode many survey items, biologists need to take the logarithms of many variables. Doing such tasks one variable at a time is tedious. Some GUIs, such as jamovi and RKWard handle only a of these functions. Others, such as the R Commander, can handle many but not all of them. Its recode ability has pluses and minuses. It has a nice dialog box that helps you to easily recode by values or ranges, and it can apply them to many variables at once. However, unless you’re happy keeping them the same name, you’ll have to rename them one at a time. Other GUIs such as BlueSky will let you assign a prefix like “recoded_" to every variable name greatly speeding the process. Deducer’s “Transform" dialog box works the same way. The “Transpose" dialog doesn’t let you select variables, which is problematic since even a single character column will become an entire character row in the output, forcing every variable in the data set to become character. You would have to make a copy of the data and delete the unwanted variables. Deducer uses standard menus where possible. Opening R data sets and importing are both handled by the usual “File> Open> Data", and that is balanced by “File> Save> Data". A workspace is an R concept, but Deducer’s use of the “Workspace" menu with standard “Open", “Save", and “Save as…" makes it very easy to use. Output is referred to as “Documents" and they’re also opened and saved from the usual “File" menu. When you start Deducer, it offers you icons that offer to take you to its online manual and training videos on YouTube.com. The default video location focuses on one plug-in for Deducer called RDSA, but clicking on the Videos link at the top of the screen takes to you an extensive set of training videos. R GUIs provide simple task-by-task dialog boxes which generate much more complex code. So for a particular task, you might want to get help on 1) the dialog box’s settings, 2) the custom functions it uses (if any), and 3) the R functions that the custom functions use. Nearly all R GUIs provide all three levels of help when needed. The notable exception that is the R Commander, which lacks help on the dialog boxes themselves (see that review for details, coming soon). Deducer’s Help menu offers “R Help" for the generic R help files, and “Deducer Help", that takes you to the software’s web site’s main help page. Each dialog also includes an “i" icon (for information). That takes you directly to a web site page specific to the task at hand. The various GUIs available for R handle graphics in several ways. Some, such as RKWard, focus on R’s built-in graphics. Others, such as jamovi, use their own functions and integrate them into analysis steps. GUIs also differ quite a lot in how they control the style of the graphs they generate. Ideally, you could set the style once, and then all graphs would follow it. That’s how jamovi works, but then jamovi is limited to its custom graph functions, as nice as they may be. BlueSky offers most of its graphs in standard ggplot2 form, but you can apply many standard “themes" after the plots are created. The dialogs for these are quite simple to use. You drag variables into their various roles then click the “Run" button to create the plot. If you would like to embellish the plot, you would instead click the “Builder" button. That creates the plot in Deducer’s powerful Plot Builder window. I clicked the “Geometric Elements" tab and choose the “Point" icon among the 36 choices shown, and dragged it onto the plotting area. It prompted me for x- and y-variables among other things. A simple, single scatterplot appeared (not shown). On the same tab, I found the “Smooth" icon, dragged it down on top of the plotting area, filled in a dialog box with x- and y-variables, and chose a linear fit. This added a linear fit to the simple, single scatterplot (also not shown). Clicked on the “Facets" tab, and dragged the “Grid" icon down on top of the plotting area and filled in the x- and y-variables of Female and Workshop. What had been a single plot split into the six-part plot shown in Figure 4. Figure 4. Deducer’s Plot Builder interface showing the “templates" tab at the top and the Scatter-Smooth component popped out of the right side. I made this graph in my reviews of both BlueSky and R Commander, and it was very quick and easy to do despite never having used those package before. In Plot Builder, it took me much longer despite the fact that I had extensive experience with both Plot Builder and ggplot2. However, if Deducer becomes your main GUI, and you use Plot Builder frequently, you will love it; it’s a GUI masterpiece! Ian Fellows created a two-part video on Plot Builder, which you can watch here and here. The way statistical models (which R stores in “model objects") are created and used, is an area on which R GUIs differ the most. The simplest, and least flexible approach, is taken by jamovi and RKWard. They try to do everything you might need in a single dialog box. They either don’t save models, or they do nothing with them. To an R programmer, that sounds extreme, since R does a lot with model objects. However, neither SAS nor SPSS were able to save models for their first 35 years of existence, so each approach has its merits. Deducer goes with the simple approach. Its modeling dialogs are fairly comprehensive, saving you the need (and denying you the ability) to do more with its models. The Model Explorer window that appears when any model is run includes an Export button. That allows you to save models, but you’ll have to use code to do more with them. All of the R GUIs offer a decent set of statistical analysis methods. Some also offer machine learning methods. Since this topic is so complex, I’ll simply list (or link to) the methods each GUI comes with and include links to make it easy to see what plug-ins area available. Load Data From Package – very handy, but an odd location! One of the aspects that most differentiates the various GUIs for R is the code they generate. If you decide you want to save code, what type of code is best for you? The base R code as provided by R Commander, which can teach you “classic" R? The concise functions that mimic the simplicity of one-step dialogs such as jamovi provides? The completely transparent (and complex) code provided by RKWard, which might be the best for budding R power users? It then goes into one of its “Model Explorer" windows as shown in Figure 5. The code for that was something like “plot(.gui.working.env$model.lm)" but it doesn’t show it. Many GUI users won’t care, but those who are trying to learn to program using R code will miss out. The other tabs on that window also show plots related to the current model. Figure 5. 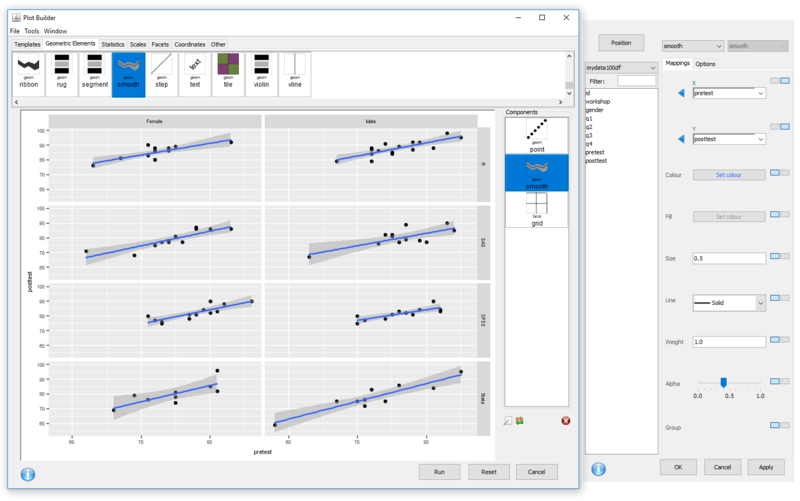 Deducer’s Linear Regression Model Explorer window, with the Diagnostics tab chosen. Similar windows appear whenever you create models in Deducer. Some of the GUIs reviewed in this series of articles include extensive support for programmers. For example, RKWard offers much of the power of Integrated Development Environments (IDEs) such as RStudio or Eclipse StatET. Others, such as jamovi or the R Commander, offer little more than a text editor. Deducer was designed to work with the JGR IDE. JGR stands for Java GUI for R, but that’s using the term “GUI" to mean menus which support programming; JGR itself includes no menus for creating graphs or running analyses. That’s what Deducer adds to it. JGR offers many of the usual IDE features including syntax highlighting, tool-tips, auto-completion, package installing/managing, and an object browser. A detailed description of JGR’s features is available here. One of the main things missing from JGR support for R Markdown. As important a topic as it is, reproducibility is a problem for GUI users, a problem that has only recently been solved by some software developers. Most GUIs (e.g. the R Commander, Rattle) save only code, but it’s not code that the GUI users wrote, so they also can’t read it or change it! Others such as jamovi, RKWard, and the newest version of SPSS save the dialog box entries and allow GUI users to have reproducibility in the form they prefer. Deducer offers only code-based reproducibility. There’s no way to get back to a filled-in dialog box when starting from the saved code. If you wish to share your work with a colleague, you would send them your code and your data set. They could run it one of two ways. If they wanted to use JGR and Deducer, they could install both, then open your code and run it. Using that approach, they would see the rich output tables complete with fonts and formatting. Alternately, they could use any R interface or IDE such as RStudio, in which case they would need install and load only the Deducer package to be able to run your code. Output from that would be in fairly nice looking tables, but they would be monospaced text, not true word processing tables. The labels for each of Deducer’s analyses are provided by its menu title, e.g. Linear Model Summary. However, you cannot change them to be more descriptive. The organization of the output is in time-order only, and you cannot even delete any of the steps you take. This often results in a messy output file filled with unneeded results. Tables of contents are commonly used in GUIs to let you re-order, rename, or delete bits of output, but none of that is possible here. You’re better off keeping a word processing file open to paste in the results that you want to keep. Deducer’s output quality is very high if the DeducerRichOutput plug-in is installed, with nice fonts of your choosing and true rich text tables. That means you can select any table and use CTRL-C to copy it to your word processor (right-clicking will not reveal the usual menu offering a “copy" choice.) That really helps speed your work as standard R output defaults to mono-spaced fonts that require additional steps to get into publication form (e.g. using functions from packages such as xtable or texreg). Figure 6 shows how Deducer’s output looks without rich text. It’s much easier to read than R’s standard output. Figure 6. Example output from Deducer without its rich output turned on. After installing DeducerRichOutput, the same dialog box (or code) will create a full word processing table like the one immediately below. With just a bit of editing, that could quickly be put into any style you like. Repeating an analysis on different groups of observations is a core task in data science. Software needs to provide an ability to select a subset one group to analyze, then another subset to compare it to. All the R GUIs reviewed in this series can do this task. Deducer does single group selections in “Data> Subset". It generates a subset that you can analyze in the same way as the entire dataset. Software also needs the ability to automate such selections so that you might generate dozens of analyses, one group at a time. While this has been available in commercial GUIs for decades, only one R GUI in this review series, BlueSky, includes this feature. Output data can be observation-level, such as predicted values for each observation or case. When group-by analyses are run, the output data can also be observation-level, but now the (e.g.) predicted values would be created by individual models for each group, rather than one model based on the entire original data set (perhaps with group as a set of indicator variables). Of the GUIs reviewed in this series, only BlueSky was able to handle all these types of output management tasks. Deducer’s ability to manage output is minimal. You can save only observation-level output, such as predicted values, residuals, model diagnostics, principal components or factor scores for reuse. This ability is controlled through the Model Explorer’s Export button. R package developers can add menus and dialog boxes to their packages by following the directions here. Deducer offers a fairly comprehensive set of tools that are easy for a point-and-click user to use. Its Plot Builder offers detailed control over the creation of graphics that is unmatched by any other GUI, free or commercial. Deducer’s popularity has leveled off in recent years while the use of other R GUIs has continue to grow. I suspect that’s due to Deducer’s challenging installation process. Deducer is visually and functionally similar to jamovi. Jamovi lacks the programming support that JGR adds to Deducer and it lacks Plot Builder. However, jamovi’s installation is extremely easy to use and its growth has been very rapid. BlueSky and the R Commander are way out front of the competition when it comes to breadth of coverage in both data management and methods of analysis. For people looking to learn R programming, they both provide more standard code, albeit in very different styles. Thanks to Ian Fellows and the plug-in developers for creating Deducer and making it free and open source. Thanks to Josh Price and Ruben Ortiz for their editorial improvements.